First time in Texas and I have already had fried catfish as well as fried alligator, which is actually quite delicious. Keeping with other firsts, this is my first United States Electronic Theses and Dissertations (USETDA) Conference, too. 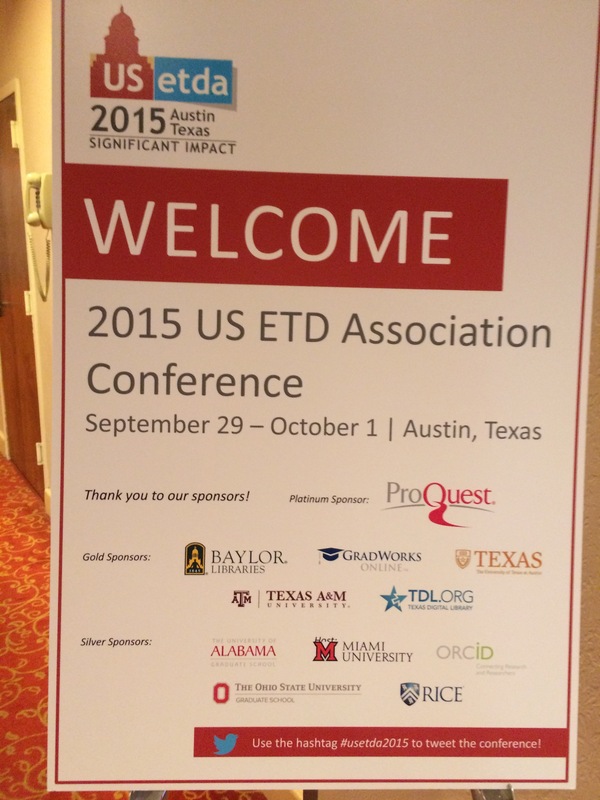 USETDA celebrates it’s 5th annual conference this year and Austin is the perfect location. The conference started off strong today, with many excellent presentations and workshops which made it difficult to chose between everything. I began my day at the morning-long ETDs heart ORCID workshop (Abstract) in which Gail Clement (Caltech) talked about the current ORCID landscape for ETDs both nationally and internationally. Next, Laura Paglione (ORCID) covered the basics of ORCID identifiers and their profiles, along with the different levels of ORCID integration. Katherine Johnson (Caltech) shared her experience with setting up an ORCID initiate on campus and plans to do more promotion this fall since it is an optional part of their submission process. Catalina Wilmers (ORCID) then demonstrated creating a new ORCID and filling out the profile, showing the search and link wizard that makes completing the profile even easier. Finally, Ryan Steans (Texas A&M) wrapped up the workshop by showcasing their open source submission system Vireo that is now use by many institutions outside of Texas. This workshop provided a great introduction to ORCID ids for beginners while giving lots of details about their use and the initiatives going on worldwide so that even I learned a lot from it even having worked with ORCID ids prior. The afternoon was just as busy and packed with great sessions. Renee E. Babcock (UT Austin) presented One Size Does Not Fit All: ETD Submission of Creative Works (Abstract). On the whole, ETDs are still considered to be the electronic version of a printed work which stifles creativity in submissions. There was much discussion in the room about finding a balance between accepting anything as an ETD submission and having strict, traditional formatting for electronic items when some of it is not as relevant as it was for print submissions. Continuing the trend of though-provoking presentations, Teri Green (University of Toledo) spoke about accessibility and ETDs. Her presentation Sudden Impact: The Changing Landscape of ETD Production and Dissemination under the American Disabilities Act (ADA) (Abstract) was a crash course in compliance and how ADA and Section 508 accessibility would work with ETDs. Currently, GVSU and CSU San Marcos require all students to submit accessible ETDs. Certainly, this could be a worthwhile endeavor among ETD professionals as more institutions tackle on-campus compliance more broadly. In the last round of sessions for today, I presented with Tim Watson (Ohio State) about Fostering state-wide collaboration for open access ETDs: OhioLINK ETD Center and the ETD Center Advisory Council (Abstract, PDF). The ETD Center hit the milestone of 55,000+ ETDs recently and the newly formed ETD Council is working on various topics to create guidelines and policies as well as deciding on new enhancements and updates to the ETD Center. Although it has been a busy day, I am looking forward to tomorrow’s presentations and the poster session. Also, the conference proceedings contains links to abstracts and presentation slides or posters as they are made available. I linked to all available above at the time of this blog post but the rest should be added soon.